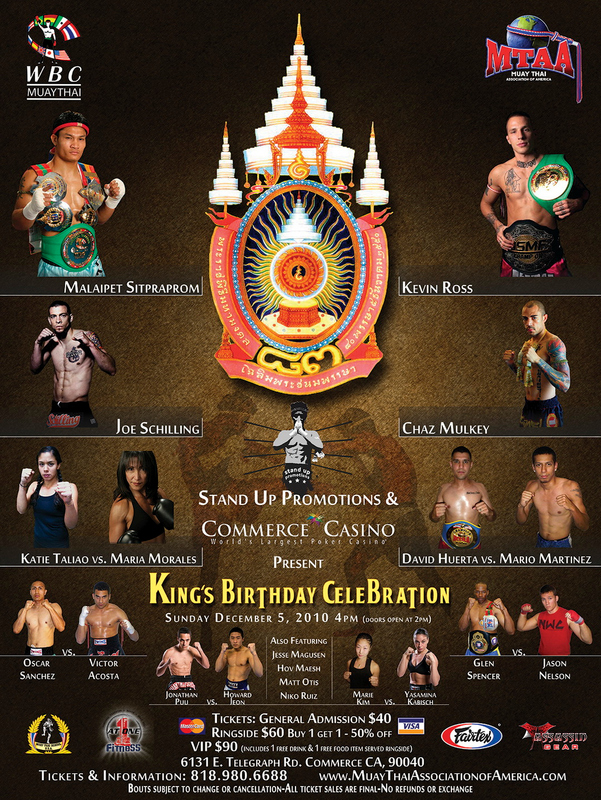 On December 5th at 4pm, Stand Up Promotions and The Commerce Casino proudly bring to you the “Kings Birthday Celebration”, in honor of the King of Thailand’s birthday and the birthplace of Muay Thai. 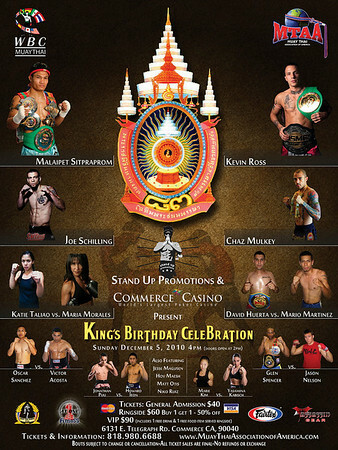 Stand Up Promotions first brought you the Muay Thai Extravaganza to celebrate Muay Thai Day, which featured the living legends Kaoklai and Saenchai fighting for World MTAA and WBC titles. This time they are ready to end the year with what is being called the biggest Muay Thai fight in the U.S. all year – a bout that will have Malaipet “the Diamond” Sitpraprom facing off against “The Soul Assassin” Kevin Ross. Both fighters are WBC International Muay Thai Champions and will meet at a catch weight to fight for an MTAA Super Fight. The co-main event will have the MTAA National Champion Joe “Stitch ‘em up” Schilling vs. WBC National Champion, Chaz Mulkey. Both fighters have promised that this fight will be a war and it will most likely be the fight of the night. The winner will earn the spot as #1 contender for the WBC Super Middleweight National title. Also on the card is rising star David Huerta as he defends his MTAA National title against Mario Martinez of Texas. Oscar Sanchez, who is coming out of a close-fought battle against Jesse Magusen, will also be defending his title against MTA’s own Victor Acosta. This show promises to end the year in exciting fashion. Stand Up Promotions along with MTAA and the WBC continue to bring high caliber Muay Thai and great matches to keep the fans intrigued. For more information call 818.980.6688 or visit the MTAA web site. ~ by fatsoking on November 29, 2010.